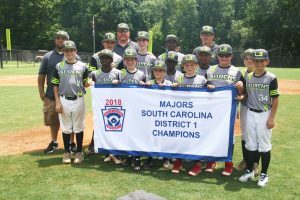 The Laurens Little League Majors All-Star Team captured the District 1 Championship by defeating an All-Star Team made up of players from Greenwood and Abbeville at Laurens City Park on Friday and Saturday June 29 & 30, 2018… The team now moves on to the State Tournament which will start on July 20, 2018 and will be played at the Northwood Little League Parks in Taylors… The team has drawn a first round bye in the tournament and will play the winner of the District 7 vs. District 5 game taking place on Friday night… Laurens is slated to take the field at noon on that Saturday… For the complete tournament brackets, click here. Friday: L3 17 – G/A 7… Laurens opened the best two of 3 tournament on Friday with a 17-7 win over the Greenwood-Abbeville (G-A) team… Laurens scored 3 runs in the 1st inning and 5 in the 4th and that eventually proved to be enough runs as they went on to take a 17-7 win over the G-A team… G-A scored their 7 runs in the last two innings after starter Jonah Hogge left the pitching mound having reached his maximum number of pitches in 4 innings… He gave up 1 hit and 1 earned run while striking out 8 and walking 2… Laurens pounded out 15 hits with Jackson Martin going 4-5 scoring 4 runs and driving in 4 also…One of Martin’s hits was a homer and Owen Pridgen also had a homer… For the game’s box score and more stats click here and for the game’s scorecard click here. Saturday: L3 11 – G-A 4… Laurens took the District Championship on Saturday with an 11-4 win over the G-A team… Laurens had only 8 hits in the game and were helped by 7 G-A errors, 10 walks and 7 wild pitches… Laurens led 6-0 going into the top of the 4th inning when the visitors plated 3 runs with Laurens getting one of them back in the bottom of the inning…. Laurens added 4 insurance runs in the bottom of the 5th and then allowed G-A a single run in the top of the 6th making the final 11-4… Jackson Martin again led Laurens at the plate going 2-3 scoring a run and driving one in… Zay Pulley had a solo homer for the team… Laurens started Seth Hill on the mound who went 2 scoreless innings with Ben Willis and Bennett Edwards both seeing relief action… For the game’s box score and more stats click here and for the game’s scorecard click here. Congratulations to the team and good luck in the State Tournament!